Lebanese Forces chief Samir Geagea downplayed the criticism of a survey that his party and the Free Patriotic Movement plan to carry out as part of efforts to resolve the presidential deadlock. “I don't understand why the issue has stirred such reactions although all parties carry out surveys on the elections and other issues,” Geagea said in remarks published on Monday. He told An Nahar newspaper that since Aoun proposed holding the poll earlier this year, the LF did not show any objection to it because it is not unconstitutional. 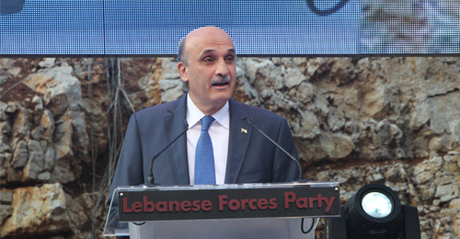 “We are not imposing anything on anyone,” Geagea stressed. The survey is aimed at showing “which are the main Christian parties (in the country) because that would push others to relatively respect this fact,” he told the daily. According to An Nahar, Kataeb Party leader Amin Gemayel has criticized the plans to carry out the survey. The Kataeb is one of the four main Christian parties in the country. The daily said that the firm which will carry out the survey was chosen and a plan is being implemented to guarantee transparency in the results. It quoted an informed source as saying that it will not be a referendum and will not violate the constitution. “Things are progressing gradually and we are taking steps towards the implementation of the declaration of intent,” he said. “We are seeking at the same time to resolve the issue of the presidency,” Geagea told An Nahar. “Some people have puzzled us. If we keep our differences, they criticize us and if we agree, we also receive criticism,” he added. The presidential candidates agreed to strengthen state institutions, not to resort to arms or violence and to support the army.